Hello ... Hello ... my old friends ... It's great to see you once again! Seeing the 2014 version of The Move performing, in part, the songs of Roy Wood last week in Worcester and listening to that superb album of Woody covers by The Flashcubes entitled "Sportin' Wood" led me to think this: Have you ever truly considered the phenomenal chart career of Roy Wood between 1966 and 1975? In less than a decade, Roy Wood wrote twenty Top 20 singles [if you include Amen Corner's #4 hit cover of "Hello Suzie"]. That's fourteen Top 10 hits and three  chart toppers! When you look at the above roster, you begin to both wonder and appreciate the huge musical legacy of the co-founder of The Move, ELO and the creator of: Wizzard. Who else [besides John Lennon, Paul McCartney and a few others] can lay claim to such astounding success in so short a time? Who knows what would have been further achieved with the correct amount of support from the Ardens? Dr. Roy Wood ... We salute you! Roy Wood is a true legend. His track record speaks for itself. No one in the history of pop music has ever written such high quality singles. The Move are mentioned in the same sentences as the Beatles and Stones, and the Wizzard singles were nothing short of sensational. Roy will never be given enough credit for his outstanding contribution to Music, and what would our lives be like without Jeff Lynne and ELO? Roy Wood is a true genius. 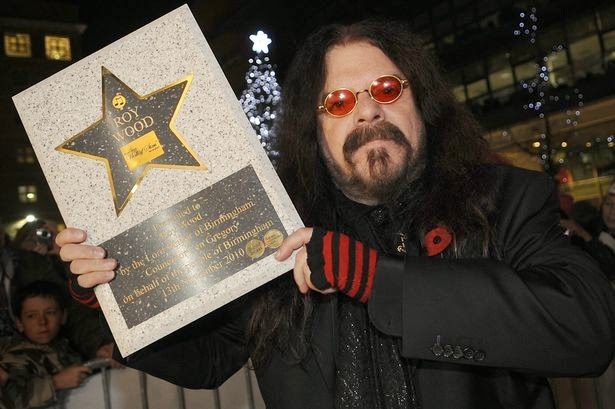 Roy Wood - the brilliant composer of so many great chart hits all with great tunes, vocals and instrumentation. Thank you Roy (not forgetting Eddie and The Falcons).